The River Kosi of Bihar is very much in the news. More than two million people have been rendered homeless and the misery of the affected is likely to increase by the day. Kosi was in the news even much before the news paperscame into existence. Folklores are there informing people about the might of the Kosi. As per that, Kosi the beautiful, naughty and perky daughter of Himalaya was pestered by Ranu Sirdar, a demon. He accosted her and pestered her to marry him. Disgusted by his advances Kosi agreed, but on condition that he will have to build a dam overnight to confine her within the Himalayas. And in case he failed, he will have to sacrifice his life. Ranu agreed blindly and set down to work with his spade. Kosi's father, disguised as a rooster came at midnight and started to give a call. Thinking that dawn has set, Ranu ran for his life, leaving behind his spade. As the story goes Ranu Sirdar comes every year and tries to harness Kosi, but she takes her revenge by gushing out of the Himalayas with a vengeance. Well folklore is a folklore, but it carries lots of meaning. Perhaps in the days of the yore, that was the way to spread the information around! Today we, the modern Ranu Sirdars are squandering billions of Rupees in an endeavor to confine Kosi within her channel, presuming her to be an ordinary municipal drain of Bihar. Barrages have been built on Kosi, perhaps without estimating her prowess or may be in a hurry to save the population! As it cuts across the Shiwalik ranges at the India-Nepal border at Bhimnagar, Kosi River appears knotted from Space. This is because the River keeps shifting course, like a hard-core criminal keeps changing his statements. Ground information and satellite pictures reveal that since 1770, the Kosi has changed course 21 times. 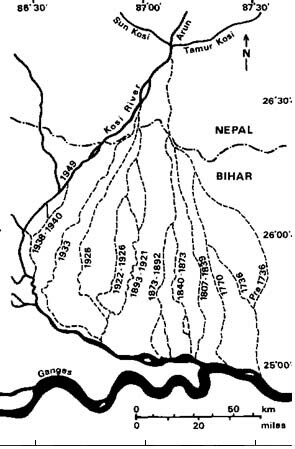 The alongside sketch shows the shifting course of the river Kosi from 1736 onwards. Why Kosi does it, changes course like a naughty child? In order to analyze the issue one has to know the ground through which the river is flowing. And to do so one has to travel to the distant past. It was around 120 million years ago that the Indian land mass, floating like a Noah's Arc on the Sea of Tethys collided with the stationery Tibetan landmass. So strong was the collision that the youngest and the loftiest mountains in the world, the Himalayas came up. But that was not the end of it. The Indian land mass still continues to go under the Tibetan land mass at an estimated rate of five centimeters per annum says Roger Bilham, noted American seismologist. Bilham also says that entire north Indian plate is subjected to almost north-south compression as a result of post-collisional movement. The compression has produced in this region some of the major earthquakes in the past, of which the tremors of 1883, 1934 and 1988 are worth recording here. Madhubani was the epicenter of the 1934 earthquake, known as the Great Assam Earthquake. 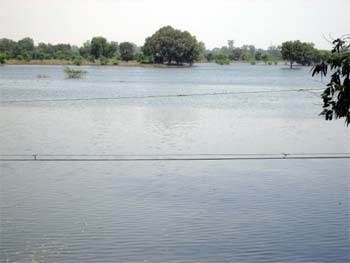 The sub-surface of the Kosi floodplain is constantly rumbling and Dunn and his colleagues in Geological Survey Of India rightly attributed it to a series of fracture zones between Motihari and Purnea. 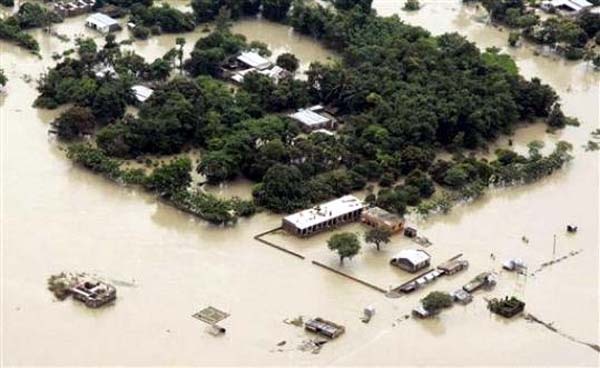 The flood plain of the Kosi in Bihar has a highly uneven basement. There are major faults traversing it at depth. As a consequence the Madhubani graben (portion of the ground that has gone down due to fault movement and forms a trough) has six kilometer thick layer of sediments brought and left by the Kosi. Six kilometers is not a small thickness. Similarly Purnea depression is present on the east, but it is comparatively shallow. One need not say in words the turbulent past of the ground through which present Kosi is flowing. Kosi is not a municipal drain of Bihar. It is a mighty river, draining areas as far as the Mount Everest. Seven sisters Sun Kosi, Tam Kosi, Doodh Kosi, Indravati, Likhu, Arun and Tamar unite to form Saptkosi in Nepal. The River as it cascades down the gorge cuts across the Himalayas carrying in its wake huge quantities of sediments. It cuts across the Shiwalik ranges at the Indo-Nepal border. The Shiwalik rocks are geologically much younger and hence less consolidated and compact. They add to the sediment load of the River. As it emerges out of the Shiwaliks in to the Ganga plain there is a sudden drop in the gradient. This makes the River dump the extra baggage (sediment load), which fans out. The fan of Kosi 180 km long and 150 km wide is the largest amongst the river fans of the world and hence called the Kosi mega fan. It is believed that the rate of rising of the catchment area of Kosi is higher than the rate of undercutting by the river that is why it has developed the mega fan. With sub-surface which is constantly unstable being a neo-tectonic zone and sinking at a rate of one meter per 1000 years, the river behaves aberrantly on the surface of the mega fan. Recent studies show that the mega fan is tilted westward. General slope of the country in the Ganga valley is eastwards. The westward tilt skews the course of the Kosi and also affects the rate of undercutting by the river. Naturally the deposit left by the river in the fan is much thicker and larger in extent than any other fan in the world. Thus several factors like river hydrology, sediment load, tectonism, regional slope and geomorphology etc control Kosi's behavior. In a nutshell, Kosi flows through a tectonically disturbed area. It has been changing course since centuries. Kosi needs to be tackled at a diplomatic level between India and Nepal. If we want to avoid destruction by the naughty river, it has to be controlled by creating storage dams in the seven tributaries at appropriate locations and utilizing the waters for power generation and irrigation. Of course the venture would be still be fraught with risk, as the terrain is earthquake prone. Still it would be worth a try. The problem of floods in Kosi is therefore, an International problem and needs a diplomatic dialogue between India and Nepal. Mere barrages to contain the River will be of no avail. No point trying to frantically control the River like Ranu Sirdar. Remember Kosi of the folklore was a very sharp woman! Kosi of the present needs sharper brains than crude attempts to catch her. There is no dearth of technology. It is just waiting to be applied. It is time for the government of India to take up the issue with the Nepal government. India can financially and technologically support the projects.